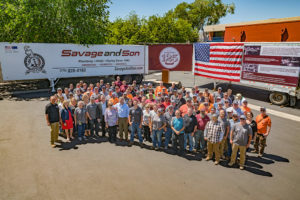 2018 marked our 125th anniversary of business here at Savage and Son. To celebrate this important milestone, we decided to create a special 125th anniversary logo and campaign to highlight our family, our employees, our historical moments and our iconic projects. We wanted our employees to be the first to know about our 125th anniversary plans, so on June 1, 2018 we kicked things off with an Employee Celebration Event at our Fab Shop. We had creative decorations, delicious food catered by Pinocchio’s Bar & Grill, 125th anniversary swag bags and amazing raffle prizes for our hardworking employees – it was a day to remember!